What are the differences between PHP Dir Submit and Submitter Script? 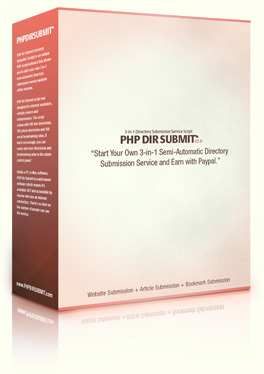 PHP Dir Submit is the most up to date version of our script and it's for commerical use. Hundreds of improvements have been made it since we changed its name from Submitter Script to PHP Dir Submit. Submitter Script is for testing purpose only and we offer no support for it. We would recommend that you go to the demo site to see the differences for yourself. Some directory sites are not working in your script, is that a bug? We do not own any of the directory sites therefore we have no control over them. However, we do manually check and update the 900 directory sites every 3 months and you will get this update free for lifetime. Can I buy the bonus directory sites without purchasing the multi-site license? Does your script have a template system like Smarty? Yes there is. It's not Smarty, it's a super lightweight custom designed PHP-based template system. Your script is too expensive for me, do you have any discounts? If you write a honest review of PHP Dir Submit on your website or blog, we will give you 50% to 100% OFF depending on the quality (traffic, design, past posts) of your blog. It must be at least 500 words or more. Alternatively, you can send us an email to let us know that you would like to be notified when the next promotion is available. First, make sure your host has PHP 5, MySQL 5 and the cURL module installed. If you're still getting the error message, copy the site URL to your browser to check whether it's a working sites. After that, if you still see the error message then you can send us the error message by using the contact form. Website and article submissions can up to 4 weeks or more for the site owners to approve them. Bu you should have received emails about the submitted sites are in the queue. .
What type of server does your script required for it run smoothly? Our script runs perfectly fine on shared hosts like Hostgator. We do recommend VPS or Dedicated servers for the best perfornance. I have a Wordpress site, can I integrate your script to it? It really depends on what you mean by "integrate". You can install the script in the sub-folder and add a link to it on your Wordpress site. If you want your users to be able to log in to the script with their Wordpress login details then you will need to modify the code. We do offer customization service, feel free contact us for a quote. I would like feature XYZ in your script, can you add it for me? Yes we can, contact us for a quote. How do I remove the "Powered by PHP Dir Submit" link? The link is there to support development of PHP Dir Submit. If you want to remove it, it's in the template folder. You can either try again later or you can contact our support team. How much do you charge for installing the script on my server? Script installation is free of charge. If you would like us to install the script on your server, please send us the cpanel logins after the purchase. What type of sites does your script supports? Our script currently support these platform: PHP Link Directory(PHPLD), Wordpress, ArticleMS, Pligg, PHPDug, Scuttle and Scuttle Plus, more will be added in future updates. How do I add more directories to the site? Go to the admin control panel and the choose either website, article or bookmarking section. I have a single site license, how do I upgrade it to the multi Site license? Login to your account and click the upgrade to "Multi Site License" link. After the payment is received, your license will be upgraded within 24 hours. Can I make changes to the design and layout? You can make some of the basic changes like the logo image in the admin panel. For layout changes, you would need to modify the template files. How do I resume an interrupted submisssion? PHP Dir Submit does automatically resume from the last submission. I don't have a Paypal account, how do I pay with credit cards? You do not need to have a Paypal account to pay by credit cards. Paypal can process all major credit cards. Or you can pay via Google Checkout. Does your script support payment system other than Paypal? Not at the moment, but we are planning to add more payment processors to the script. Do I need to register my own accounts before I can start using the script? We have already done this for you. You only need to do this if you want to add your own sites to the script. Why is the captcha image not showing on some sites? Not every site has the captcha image. How do I change the logo and design? You can do this in the Manage Contents section inside the admin panel. Can you design a custom template for me?